Synopsis: Provides a practical step-by-step guide to writing a winning business plan. For most new start-up and growing businesses, securing funding from backers is one of the key steps on the path to success. When it comes to winning investment, a strong business plan is the most powerful tool in an entrepreneur’s armoury, yet surprisingly few business leaders know how to put together and pitch a truly compelling business plan. 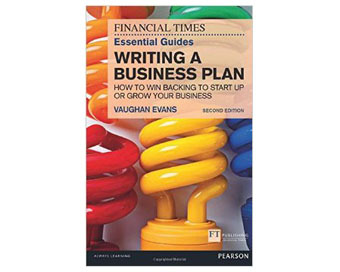 The brand new edition of The Essential Guide to Writing a Business Plan (FT Publishing) provides a practical step-by-step guide to writing a winning business plan. Every word on every page is geared towards addressing the concerns of your backer. The author, Vaughan Evans, has over 30 years’ experience of both writing and assessing business plans across the full range of sectors and on businesses ranging from small to giant. As an independent strategy consultant, his specialism is business planning for corporate clients and strategic due diligence for private equity, advising financiers on whether or not they should invest in a company, so he understands what should be included and exactly how it should be pitched. The first edition of The Essential Guide to Writing a Business Plan has been the best-selling book on the topic, and this new second edition has been expanded to offer practical advice on how to take the next step and successfully pitch a business plan. It also provides example templates and check lists for every part of the business plan, illustrating what your business plan should look like to firstly attract and then address the concerns of a potential backer. The brand new second edition draws on the specific challenges faced by start-ups, particularly on pinning down perceived market niche and competitive advantage. It is not limited to new businesses, however, and offers equally practical advice for expanding businesses looking for development capital and middle-managers seeking board approval for projects.